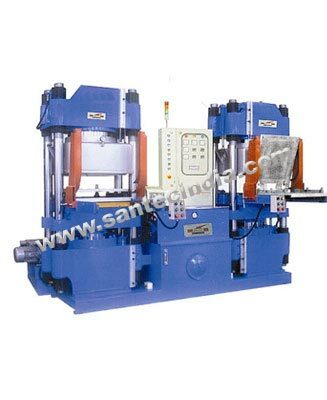 Santec's Vacuum Compression Molding Press comprises of two sections, a Vacuum Molding Press and an automatic Mold Ejection System. Both the segments are connected with automatic mould handling arrangement, sequenced with press operation. The machine is automatically operated resulting considerable saving of time. As the process of molding is done in the vacuum, components are moulded with assured control parameters without any porosity. These moulding machines are the most convenient and fastest way for producing plastic casing with varying dimensions.